Tens of thousand of items are sold each day on the eBay marketplace; a treasure trove for anyone wanting to find out how much an item is worth. It makes sense to research the price of an item that you want to sell before you do so. This is especially true if you sell it locally, or on marketplaces that require that you enter a fixed price for the item. And if you are in the market for buying an item used, you may also want to know what comparable items have cost in the recent past so that you do not overpay. One of the better ways to research the price of items is to use eBay for that. While there is no guarantee that you will find the exact item on the site, the chance is high that you will especially for items that are relatively popular, as millions of items get sold every month on the marketplace. When you search for items on eBay using the default search option on the site, eBay returns a list of running auctions or buy it now offers only, but not auctions that have been completed in the past. Since you are allowed to ask for any price regardless of item, it is often the case that active auctions and buy it now offers don't reflect the value of an item well. 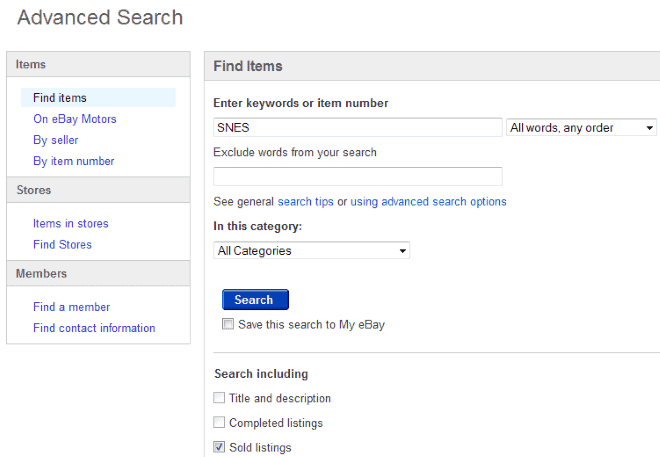 You need to click on the Advanced link next to the big search button on the eBay website to open the advanced search form that provides you with additional search parameters. Or, simply click on this link to open the page directly. You may bookmark the link so that you may access it quickly whenever you need to. Note that you may need to change the eBay URL if you want to search a regional marketplace, e.g. eBay UK or Germany. Locate the "search including" group on the page and check "Sold listings" there. This includes only items that have been sold on eBay in the results, exactly what is needed. Now enter your keyword, and make other changes if you want, for instance to search in title and description fields, only return new or used items, or only offers from a specific seller or location. Once you click on search on the page, you are taken to the results page. 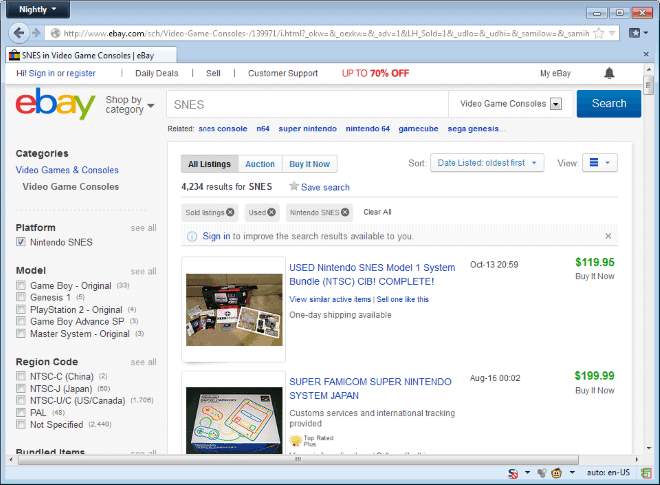 It looks similar to the regular auction pages on eBay, but with the difference that you find sold items listed there exclusively. Here you find sold items listed with the most recent items listed first.You may change the sort order from "end date: recent first" to one of the other options, for instance to sort by price, oldest first, or location instead. Depending on what you searched for, you may want to narrow down the results listing further by selecting a category on the left, or making other refinements to the search to filter out results that are of no interest to you. If you search for a smartphone for instance, you may want to narrow down the search results to the smartphone category, and not accessories, screen protectors or cases. This improves how fast you can go through the listing, and how fast you find results matching items that you want to know the price for that they are worth right now. Other filters that you may want to consider are "new" to only return items listed as new (opposed to used), seller type (commercial or private), or articles from a certain location / region. It may take a while to browse through the list of results, and the buy it now prices listed here may be somewhat confusing at first. Just remember that all items listed here have been sold, so that the BIN is the price that it has been sold for. Item condition: new fetches more than used, and mint condition more than used condition. What's included: a smartphone auction may include an extra battery, a memory card, or other accessories, while another may not. Seller reputation: Items sold by a reputable seller may be sold for more than items sold by a new account, or by an account with negative ratings. Also true for items sold from sellers from another country. Time of day, and day: The day, and the time of the day, an item was sold may impact the price as well. Items sold late at night may fetch less than items sold during the morning or evening. Auction date: Items are usually worth more when they are sold nearer to release or availability, and worth less the farther you stray away from the date. This is not true for all items, and some may retain their value. Generally speaking, you usually get less for an item the longer it has been available. There are other factors such as "luck" that play a role, but the most important from a "finding out how much an item is worth" perspective is the condition, and what is included in the auction. The majority of heavy eBay users know how to do full searches already but eBay as a site is still very lacking. Example. Often while using advanced search options it still shows junk in results to include accessories, and stuff not even remotely related to the item we’re searching for. Often I simply add the item(s) to a watch list, then from the watch list I use the drop down menu to access the menu item, “view similar”. That does a better job of narrowing down the exact product I am looking for, but it fails in location, prices, and shipping options aspect. Often the result of the, “view similar”, list do not show up in any sense of order in regards to prices, shipping cost, location and currency. Also there is no way to re-order the results into prices, shipping, popularity, location, etc… So as long as I am looking for the exact same product with a generalization of shipping prices the, “view similar”, feature is very helpful and faster that using advance search. Ultimately the results is based on the category the seller listed their items in and often they either spam terms or brand name with no relevance to the product they are selling, or simply wrong category. The, “view similar”, menu option does not rely on that but instead does a picture search as first priority, then similar terms as a second criteria, which is why I like using, “view similar”, when looking for a specific item.